Taipei, Aug. 21 (CNA) Taiwanese sailing in waters in the vicinity of the disputed Diaoyutai Islands will be protected, the Ministry of Foreign Affairs (MOFA) vowed Tuesday in the government's latest rhetorical salvo in the ongoing diplomatic squabble. 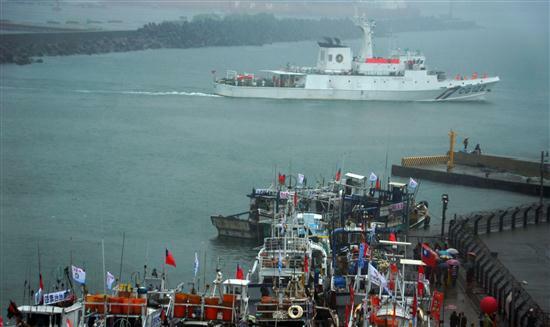 The necessary protection will be offered to activists and fishermen operating near the Diaoyutais because "they are a part of the territory of the Republic of China," MOFA spokesman Steve Hsia said at a routine press conference. Crews sailing to the area, however, must "register through legitimate means," Hsia said. According to regulations, all vessels departing from Taiwan must register with the Coast Guard Administration at least two days before sailing off. Taiwanese fishermen or others operating in waters near the islands, located 100 nautical miles northeast of Taiwan, are normally taken into custody or chased away by Japanese authorities. The spokesman's remark came amid escalating tensions in the East China Sea because of recent symbolic moves to assert sovereignty claims over the uninhabited island chain, which is currently controlled by Japan. On Aug. 15, a group of activists from Hong Kong who traveled by boat to the islands were arrested by Japan's Coast Guard for having illegally entered Japanese territory. Following their release, a group of Japanese politicians proceeded to the islands in a flotilla on Aug. 19, hoisting a Japanese flag on one of the islets. As the dispute simmered, Taiwan's foreign ministry issued a statement that said in an unusually harsh tone that the Diaoyutais had been "furtively occupied" by Japan and reiterated the country's sovereignty over the islets. The Diaoyutais are known as the Diaoyutai Islands in China and the Senkaku Islands in Japan.